Fourteen miles west of Istanbul’s Atatürk airport on the coast of the Sea of Marmara, a pearl looks set to rise out of the water. 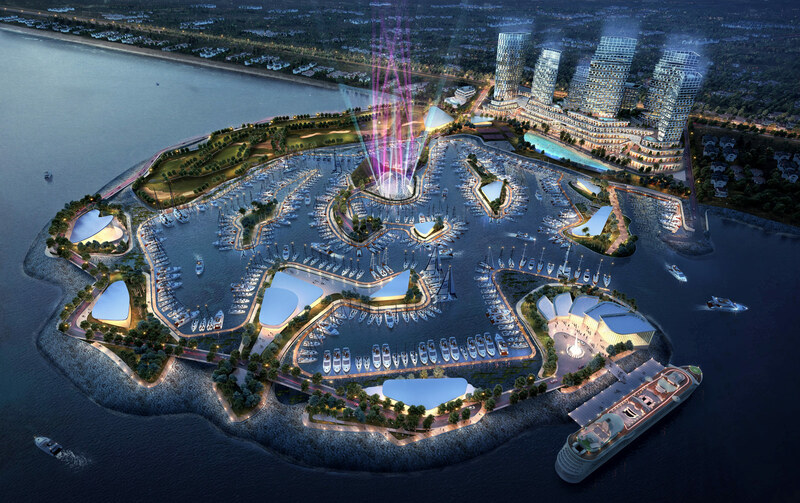 Designed by Chicago firm Forum Studio, the mixed-use development covers 1,660,000 square feet, offering close to 1,500 residential units and a 500 boat marina. Low-rise volumes and a host of landscaping features make up the majority of the marina, facilitating undisturbed views out to sea for those living in the high-rise dwellings on the natural shoreline. “Changes in scale—from the monumental to the intimate—accommodate a variety of uses that will include nightlife and entertainment as well as family-friendly activities and academic marine research facilities,” said Andersen. Currently, the project is going through initial municipal approvals for the land development. The schedule for groundbreaking is yet to be determined. 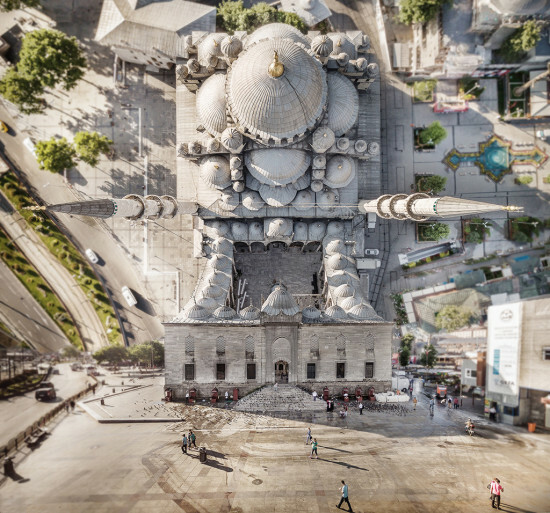 Inspired by the notions of varying dimensions and surprise Edwin A. Abbott's Flatland: A Romance of Many Dimensions, Turkish digital artist and photographer Aydın Büyüktaş has created a fanciful Istanbul in his latest project. Aerial depictions of the city turn the landscape on itself—literally. Using a drone, his photographs have been digitally manipulated to appear as if the city is doubling back over itself creating a fantastical curved world. Büyüktaş's images can appear disorientating at first sight with the viewer's eye naturally following what should be linear forms that end up being viewed from alternate perspectives. The scenes resemble those from Christopher Nolan's Inception and Interstellar movies where cityscapes are curvaceous, both in dreams and in space. https://www.youtube.com/watch?v=LRT0GGTWYnM https://www.youtube.com/watch?v=dG22TcpjRnY Creating the curving montages in a flat world was no easy task. Drone's were sent up into the skies, but Büyüktaş had to rely on the weather and wildlife to be on his side. "So many times I had to turn back without a picture because of bad weather, technical problems, or birds attacking the drone," he said. Once he had collected all the images, Büyüktaş adopted the much more grounded approach of editing and patching them together in Photoshop. "We live in places that most of the times don’t draw our attention, places that transform our memories, places that the artist gives another dimension; where the perceptions that generally crosses our minds will be demolished and new ones will arise," Büyüktaş says on his website. "These works aims to leave the viewer alone with a surprising visuality ironic as well,multidimensional romantic point of view." For 1475 years, the colossal dome and four minarets of the Hagia Sofia have remained the focus of Istanbul’s historic silhouette. That is, until three hulking towers known as the OnaltiDokuz Residences interrupted the scene last summer, sparking another battle over development in the Turkish capital. In late May, the Hurriyet Daily News reported that the city’s 4th Administrative Court ordered the demolition of the skyscrapers, claiming that their construction was illegal because it "negatively affected the world heritage site that the Turkish government was obliged to protect." 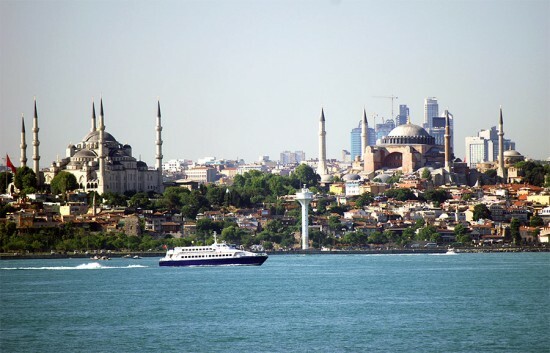 To guard against future infractions, this Wednesday the Turkish Parliament passed legislation calling for additional safeguards nationwide to protect historic areas from rapid urbanization. Prime Minister Recep Tayyip Erdogan has expressed his distaste for high-rise development within the city in the past, and urged the towers’ owner, Mesut Toprak, to shorten his skyscrapers. The three towers, coming in at 37, 32, and 27 stories, are located in the Zeytinburnu district on the European side of Istanbul, and represent a recent surge in unplanned building and urbanization that is going on throughout the historic city. While the city’s economic upswing is welcomed, the non-contextual form it has taken is not. The public has reacted positively to the demolition ruling, but many worry that there is little hope in curbing the buildup at this point. “I side with a form of architecture that accords with our culture,” said Erdogan in an address to local lawmakers last month. “In Istanbul and Ankara, there are structures that have gone against the characters of both cities. I don’t approve of vertical structures; rather I favor horizontal ones. Four stories should be above the ground, while the other four should be built underground.” This comes in stark contrast to other cities like London and Washington, D.C. that are grappling with potentially raising height limits to allow for greater density and new development. Meanwhile, the towers’ owners plan to seek an appeal, claiming that they complied with zoning regulations and that their project is in no way illegal.